Popular among Asians and chefs, Sushi Sake in Richardson poofs up its presence. In a perfect world, people love you for who you are, not what you look like. Welcome to the real world. And so it is that Sushi Sake, looking “rested” and “relaxed” (code for “facelift”) in its new-and-improved space, has become more beloved than ever. Which is saying something. Despite its unfashionable address in Richardson (no hard feelings), Sushi Sake has a loyal following, one that includes a high percentage of Asian customers, a fact often cited (usually by non-Asians) as one sign of a good Asian restaurant. This crowd’s loyalty is to chef-owner Takashi Soda, whom they’ve been following since his days at Nakamoto. 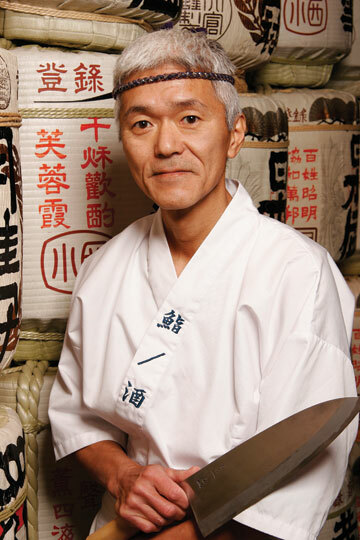 He left there to open Sushi Sake in 1997, in a small strip center storefront on Campbell Road. The square footage there was limited, which meant it was hard to get seated during peak hours, which only made getting seated that much more desirable. The new location sits a few blocks away, in a free-standing building that used to be a Chinese restaurant called Monkok. Not that it matters; the space has been transformed by Paul Draper, the restaurant-design wiz whose previous projects include Sevy’s and Seventeen Seventeen. He designed the original Sushi Sake location, too. Eager to preserve the character of the original, Draper duplicated its unique seating that mimics the feel of a tatami room. The tables are like platforms, with built-in benches; you sit on a cushion. Made of wenge, a tawny colored tropical wood, the tables seat six but are predominantly used as communal seating. Even if you don’t end up chatting with your neighbors, the physical proximity relaxes the usual boundaries between strangers, which is a very urban thing. We have so much space that we don’t usually need to get that close. For those lukewarm about the idea of rubbing elbows, traditional booths ring the perimeter of the room. Another cool decorating motif is the use of chalkboard, and not just the big one behind the bar that lists specials. The walls have chalkboard panels with a Jackson Pollock-esque scrawl. It’s actually chalk lettering, in layers so dense, the words are incomprehensible. At the opening party, attendees skilled in calligraphy were invited to make contributions. After the party was over, the display was sealed to become a permanent piece of art. To paraphrase the men’s hair club ads, Draper doesn’t just decorate Sushi Sake, he eats there, too. So do many other sushi fanatics, including A-list chefs. 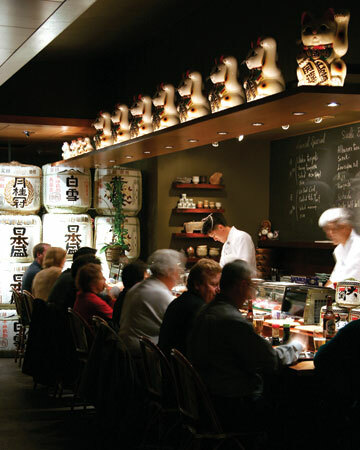 While not necessarily as hip as Teppo or Tei Tei, Sushi Sake is known for its discriminating quality and reliability. There’s value in knowing that the fish comes from a dependable supplier and is subsequently handled with care by the chef—or in this case, chefs, since Takashi is backed by a team of up to six knife-wielding comrades. Nearly every table in the place seemed to have ordered the rainbow roll, one of the prettiest and most luxurious of sushi rolls. It was a California roll draped with thin slices of avocado and raw fish—tuna, salmon, yellowtail—that formed a pretty, multicolored mosaic. Every slice of the roll offered a different combination of fish. The luxury came from the combination of fish and the creamy, chopped crab filling. In contrast to the rainbow’s lush, raw softness, the dragon roll had sheets of cooked eel, flaky and white, its chargrilled edges artfully drizzled with teriyaki sauce. But best of all was the tempura roll, an irresistible maki enclosing crisp, tempura-fried shrimp. Though not as cutting-edge as Tei Tei, Sushi Sake had its surprises. Not everyone does the fotomaki roll, filled with the cooked omelet known as tamago, and few do a version as sweet and delicious. One fine non-sushi treat was a soup called niku tofu, with cubes of quiveringly soft tofu and paper-thin shaved beef floating in a clear, flavorful onion broth—a minimalist’s version of French onion soup. Sushi Sake’s only major oddity was its use of long-grain rice; it lacked the subtle stickiness and satisfying “chew” of traditional short-grain sushi rice. The rolls felt less compact, less “snug,” and more likely to fall apart in the mouth. Service can be baffling. Most of the customers are long-timers or at least know their way around a sushi menu, and that level of savvy seems to have spoiled the staff. It’s not that they’re malicious; it’s as if they don’t know quite what to do when faced with a novice. Don’t expect niceties such as a bowl of ice in which to rest your sake. In fact, you may need to remind the server to bring your sake at all. It’s undoubtedly different for the regulars. But, hey, they’re the ones not so shallow as to judge a place by how it looks. Get contact information for Sushi Sake.